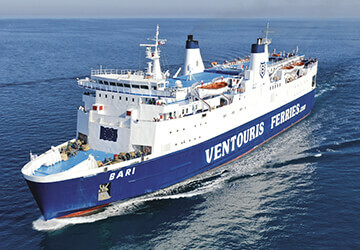 Although a Greek company, the Ventouris Ferries travel hub is Bari, from where the entirety of their routes either depart or arrive. Beginning services in 1978, they are now a recognised leader in the national ferry market, transporting thousands of customers each year, boasting world-class ships alongside a friendly and professional service. Four large, roll-on/roll-off ships sail under the Ventouris Ferries colours of dark blue, red and white, accommodating a significant number of passengers and vehicles, and offering an excellent selection of on-board facilities, ideal for the long-haul journeys. Entering service in 2017, MS Rigel III is the fastest vessel, travelling at nineteen knots, while MS Rigel II is the largest, holding up to eighteen hundred passengers and five hundred cars. MS Bari and MS Rigel I, although slightly smaller, still have comfortable cabins, full air-conditioning and duty free shops. 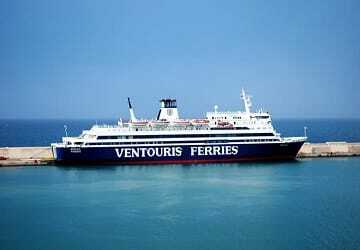 Use directferries.co.uk to find Ventouris Ferries timetables, prices and to book Ventouris Ferries ferry tickets. Looking for the lowest fares for your destination? 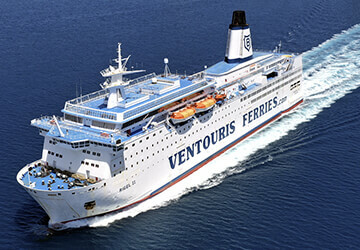 Don’t worry, we’ll also compare Ventouris Ferries with alternative ferry companies.